The Underdogs: Since the partnership of Harvey Mason, Jr. and Damon Thomas became official in early 2000, the duo known as The Underdogs have penned and produced songs for both industry legends and today’s biggest superstars. Everyone from Beyoncé to Aretha Franklin, Justin Timberlake to Elton John, Chris Brown to Luther Vandross, Britney Spears to Whitney Houston have all called on The Underdogs to deliver musically unique, yet radio friendly hit records. 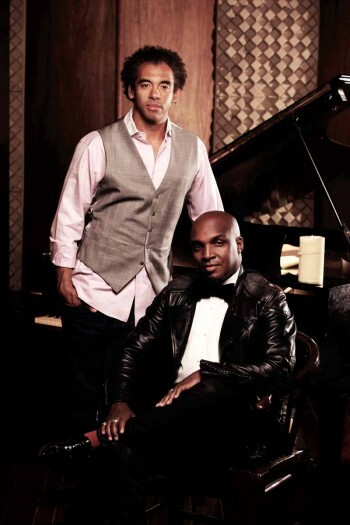 They used this combination in their work with numerous artists including Kelly Clarkson, Rubin Studdard, Jennifer Hudson, and with Jordin Sparks on her smash hit, “No Air”, featuring Chris Brown.. Thomas and Mason have since solidified their standing as one of the most sought-after production duos in music industry. Every label in the music game has come to count on The Underdogs to break their biggest artists. The Underdogs have endeared themselves to music visionary Clive Davis, Interscope head Jimmy Iovine, and Def Jam president Barry Weiss among many others.. “I think one of the reasons artist and execs like what we do is because we try and make every song specifically for that artist,” says Harvey, “We don’t make generic songs.” Records produced by The Underdogs have sold 75 million copies and generated many hit singles.